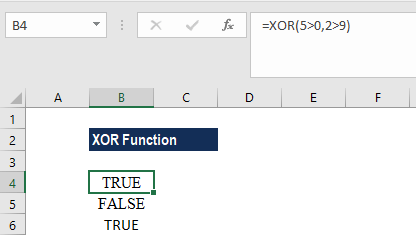 The XOR Function was introduced in Excel 2013 and is available under the Logical function. It is a logical exclusive OR function. For a given two logical statement, the XOR function would return TRUE if one of the statements is true and FALSE if both statements are true. If neither of the statements is true, it also returns FALSE. Logical1, logical2 – Logical1 is a required argument, whereas logical2 and subsequent logical values are optional. 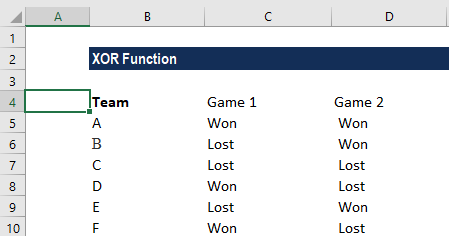 How to use the XOR Function in Excel? FALSE – When all statements are false or when the total number of TRUE statements is even. Teams who won both games qualify for the final. Teams who lost both the games are out of the tournament. Teams who won only one game out of the two are required to play the third game to determine which team goes into the next round and which team doesn’t. The formula used here is =IF(XOR(B2=”Won”, C2=”Won”), “Yes”, “No”). Thus, XOR made it easy to pair up teams. Generally, XOR is used along with another logical function. Adding the IF Formula will do one thing if a condition is TRUE, and will do another if a condition is FALSE. Often when using the OR Function, we shall “nest” it within an IF Function. The other logical functions that can be used are AND functions, which test if all conditions are met. We can also use OR formula to test if one or more conditions are met. The XOR Function allows to test up to 254 functions. #VALUE! error will be returned when logical values are not found. #NAME! 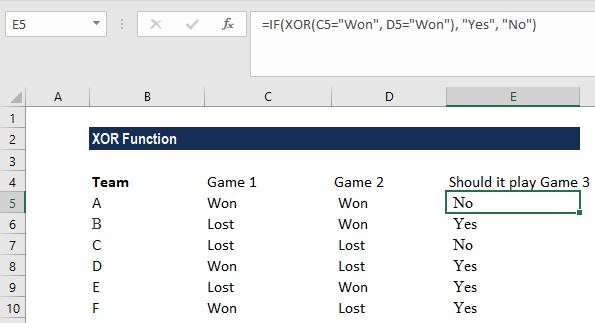 error will be returned when the function is used in Excel versions earlier than 2013. Arguments should be evaluated to logical values such as TRUE or FALSE, or in arrays or references that contain logical values.